This beautiful new pinup titled 'Moonlight Serenade' is #56 in Greg Hildebrandt's American Beauties Series. Greg actually started this painting at the 2010 Barrett-Jackson auction in Scottsdale, AZ. He finished it back in New Jersey after the show in March. 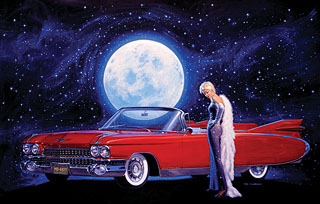 The 1959 Cadillac Convertible has always been one of Greg's favorite vintage automobiles. Every loves a red Convertible. Acrylic on canvas. ----- FRAMED Created in March 2010. Signed by Greg Hildebrandt 8x10 and 13x19 glossy photo prints are also available of this. As with all of our products, lay-a-way plans are always available.